Trainer Tony McEvoy has had a big week with six of his last seven runners winning following the success of Yulong Savings on debut at Bendigo on Friday, February 8. 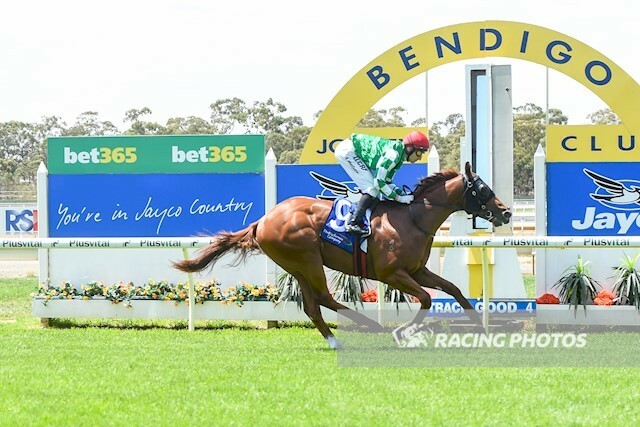 Ridden by Andrew Mallyon, Yulong Savings ($3.20 fav) raced away to score a 3-1/2 length win in the Bendigo Cleaning Company Maiden (1100m) beating Asateer ($4.60) with Bachelor Baron ($17), 2-1/4 lengths away third. The winner, bred at Cornerstone Stud adjacent to McEvoy’s Kildaton Park stables at Angaston, cost just $30,000 at the 2018 Adelaide Magic Millions Yearling Sale. The colt is owned by Yu Long Investments and followed a win two days earlier for the same owner-trainer combination with Rowsthorn. Victorian stable foreman Michael Shepherdson said blinkers were a great training tool. “The blinkers on today were a great benefit,” Shepherdson said. “Andrew gave him a good ride and he put a margin on his rivals at the finish. “Bendigo is such a good place for young horses to make their debut, it is always in great order. Shepherdson pointed out that Yulong Savings was the stable’s fifth individual two-year-old winner in just over a week. Winning jockey Andrew Mallyon said Yulong Savings was a very professional colt. “He had good grounding from a very professional two-year-old stable,” Mallyon said. “It was a bit willing early and I thought about trying to ride the perfect race but decided they were going a tad too quick and rather let be where he was happy. “I just cruised along in my own gear then when he quickened, he put them away really easily. “He idled to the line and there is a bit of improvement as well.